One of the greatest all-around skiers of all time, Kjetil-Andre Aamodt is the most decorated racer in the sport, walking away from the piste with 20 medals: eight at the Olympic Games, 12 at world championships. And to add another timeless chapter to his career, one must only look back to Turin in 2006 when at 35, the Norwegian became the first skier to win four Olympic golds as he landed the super-G crown to sit alongside previous achievements of two silver and a pair of bronze Olympic medals. Aamodt has also won five world titles including an unprecedented triple of combined golds (1997, 1999, 2001) as well as the slalom/giant slalom double in 1993. Curiously the one slight glitch for this complete all-rounder is that he only won the World Cup overall title on one occasion (1994) but he did lift crystal globes in four of the five disciplines (exept the downhill) at least once in his career (combined 1994, 1997, 1999, 2000, 2002), the super-G (1993), giant slalom (1993) and slalom (2000). Born in Oslo, the name of Kjetil Andre Aamodt was first mentioned in glory at the 1990 world junior championships where he won the downhill and combined and finishing on the podium in the super-G, giant slalom and slalom. He followed that up with a super-G silver at the 1991 worlds at Saalbach before his first World Cup victories at Panorama and Aspen one year later. Three months after being hospitalised with a serious infection which saw him lose 11kg (24lb) in weight the Norwegian bounced back to win the super-G Olympic gold at the 1992 Games in Albertville. Along with his rival and accomplice Lasse Kjus he became the leader of the Norwegian team and finished second for the overall World Cup crown, picked up two gold medals and a silver at the 1993 world championships in Morioka. But while he performed admirably on home soil at the 1994 Games, he would settle for silver in the downhill and combined while taking super-G bronze. Not all was lost however as he won the World Cup overall time for the first and only time in his career. Aamodt's career then took a bit of a slide as he was hit by injuries until getting back to his best in 1997 to take the world combined gold medal at Sestrieres. During the 2000 season he became only the fourth skier ever to win World Cup races in all five disciplines and success at the 2001 world championships in St Anton set him up nicely for the 2002 Olympics, where he won the combined race and the super-G.
At the 2003 world championships, a third-place finish in the combined race and a second in the downhill gave him a record 12 all-time medals in the tournament bettering the previous mark held by Girardelli. 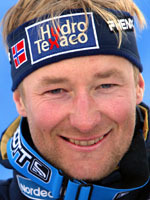 Aamodt was then ruled out for much of the 2004 season after breaking his ankle and although he came back never got inside the top three on the circuit or at the world championships that season. But he woke up in time for the Turin Games in 2006 and went to Italy in high spirits where he made more history with that fourth gold in the super-G.
A knee operation in March 2006 at the age of 35 finally persuaded the great Norwegian to call it a day while the Vancouver Games in 2010 were probably not beyond him.